Deprecated function: The each() function is deprecated. This message will be suppressed on further calls in book_next() (line 811 of /mnt/target03/362662/www.hollywoodgossipwire.com/web/content/modules/book/book.module). 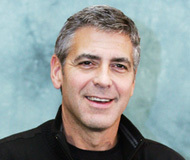 George Clooney was born on May 6, 1961 in Lexington, Ky. His parents are Nina Bruce, a former pageant winner, and Nick, a broadcast journalist. He has an older sister, Adelia (better known as Ada), and is the nephew of Rosemary Clooney.